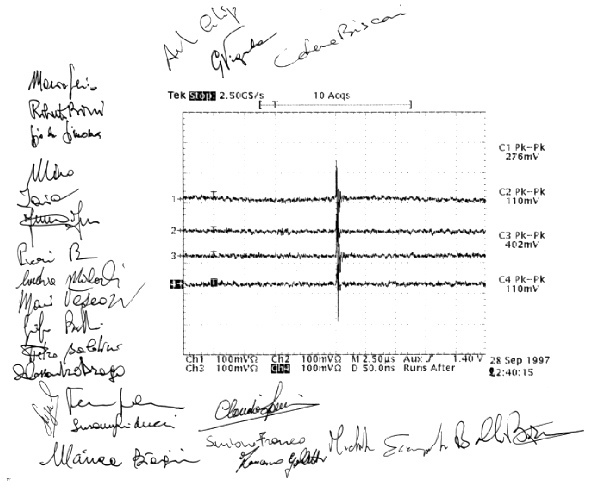 On Monday, May 29, 2000, more than 1 A beam current has been stored for the first time in the positron ring. The current was distributed between 60 equally spaced bunches. No significant instabilities were observed during stacking. On Wednesday, April 14, 1999, during the first tune-up of DAFNE with two beams and the superconducting detector solenoid in operation, a luminosity of 1.2*1029 cm-2s-1 has been reached in single bunch mode with 11 mA in the positron beam and 7 mA in the electron one, corresponding to ~70% of the luminosity expected for this current.The first Bhabha scattering events have been observed in the KLOE detector. A preliminary estimate of the event rate is in agreement with the indications of the machine luminosity monitor. After less than one week of machine commissioning with the superconducting KLOE detector solenoid and compensators on, compensation of coupling has been reached for both electron and positron beams with the same configuration of the interaction region. The measured residual coupling is less than 3% for both beams. 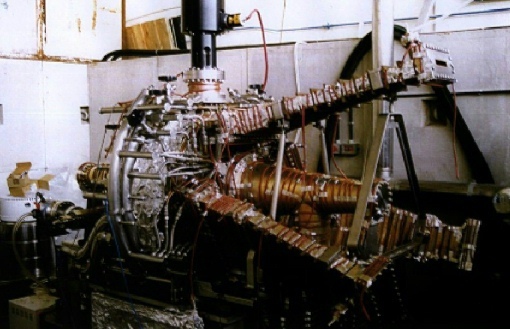 On Sunday, March 28, 1999 the positron beam was stored in DAFNE with the superconducting KLOE detector solenoid and compensators running at their nominal field. During two weeks of DAFNE commissioning, still in progress, just before the KLOE detector installation, two beam multibunch operation has been realized for the first time on Friday, November 13. 13 bunches have been stored in each beam up to a maximum current of 200 mA each. Luminosity in the range of 1031 cm-2 sec-1 in multibunch configuration (13 bunches/beam) has been measured. On Saturday, October 31, 1998, during a two weeks shift dedicated to single bunch luminosity tune-up, the commissioning milestone of 1030 cm-2s-1 has been several times exceeded in the DAFNE Main Rings. On Sunday, March 1, 1998 the first electron-positron collisions have been achieved in the DAFNE Main Rings. The collider was running in the single bunch mode, with the current in each beam ranging from 1 to 4 mA. The maximum value of the luminosity was between 2 and 3 x 1028 cm-2 s-1. This value must be scaled by a factor of ~100 at the design current of 40 mA per bunch. 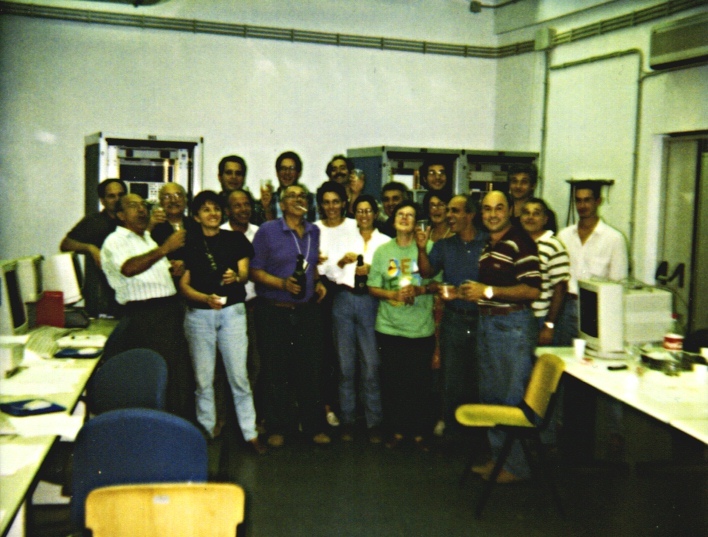 During the scheduled first 2 weeks of commissioning, on November 28, 1997, the single bunch design current (44 mA) has been exceeded in the positron ring of DAFNE. After optimizing the transport efficiency from the Accumulator to the Main Ring, and correcting the chromaticity by means of the sextupoles in the achromats, ~70 mA in a single bunch have been easily stored. Multibunch injection has also been successfully tested, reaching 250 mA limited by residual gas pressure in the vacuum chamber. No evidence of any instability has been so far detected. After storing the first positron beam into the Accumulator on November 19, the following two days have been spent in optimizing the injection rate. Having reached more than 10 mA/s into the Accumulator, the commissioning of the Transfer Line from the Accumulator to the positron Main Ring was started. On Saturday, November 22 after lunch, the beam was driven on the fluorescent screen after the injection septum magnets. After half an hour, spent in tuning all the magnets, the first 0.5 mA positron bunch was stored at 16.30 p.m. The measured lifetime at zero current was of the order of one hour. Further commissioning is under way. On Tuesday, November 18, 1997, a new series of commissioning shifts was started by setting up the LINAC with positrons. After tuning up all subsystems, the nominal LINAC performance with positrons (33 mA @ 510 MeV, dE/E~±0.3%) was reached with high reliability on Wednesday evening. It took about one hour to transport the beam correctly through the positron branch of the Transfer Line up to the fluorescent target at the entrance of the Accumulator. As expected (since the Accumulator is already working at the design performance with electrons), a first beam of 15 mA was immediately stored before shooting a bottle of sparkling wine. The injection rate has been then improved and the stored current reached 35 mA. Extraction of the stored beam has also been successfully performed. Further commissioning is under way. The first electron beam has been stored into the electron ring of the DAFNE collider on October 25, 1997 at 10.30 p.m. During a shift started at 2 p.m. the 510 MeV electron beam has been transported to the injection point of the electron Main Ring. With the RF cavity off it was possible to keep the beam inside the ring for ~0.3 ms, which is the maximum value allowed by the energy loss due to the emission of synchrotron radiation and the aperture of the vacuum chamber. The RF cavity was then switched on and the beam captured and stored in the ring. The position of the beam along the ring has been measured by means of the beam position monitors and found to be in agreement with the alignment tolerance. Multistacking was also successfully performed. Beam current waveform in DAFNE with the RF cavity off. The decrease is due to the drift of the particles towards the inside of the ring induced by the emission of synchrotron radiation and the vacuum chamber aperture limit. The beam survives inside the vacuum chamber for ~0.3 ms.
On Sunday, September 28, at 10,40 p.m. the first electron beam has been injected into the electron ring of the DAFNE collider. During a 10 days shift started on September 18, the electron beam has been extracted for the first time from the Accumulator. After reaching 100% efficiency extraction and stable operation in the damping ring, the beam has been driven through the Transfer Line up to the pulsed magnets which allow the passage of the beam in both directions through the same vacuum vessel. Commissioning of these special magnets has been completed rapidly and successfully. The beam has been then transported along the ~70 m long channel up to a fluorescent screen target right at the entrance of the electron ring. After extracting the target, the beam has been detected by means of beam position monitors along the first quadrant of the Main Ring. The DAFNE staff on shift during the first injection into the Main Rings celebrating the event. The vacuum-mechanical assembly of the DAFNE Main Rings was successfully concluded on August 6, 1997, with the installation of the last section of vacuum chamber in the FI.NU.DA Interaction Region. The vacuum system, already in operation on the achromats, was switched on also in the last segments, and the day after, August 7, the collider was completely under vacuum. 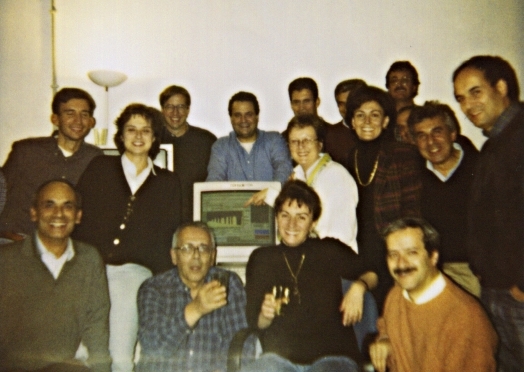 On February 23, 1997, during a one week shift, the DAFNE LINAC accelerated 20 mA positron bunches at 525 MeV. The nominal values for injection into the Accumulator ring are 10 mA (minimum) and 510 MeV. The shift was dedicated only to increase the beam energy, while positron production and capture were not optimized. The improvement (125 MeV) of the positron energy was mainly obtained by tuning all the four SLEDs and by conditioning the modulators up to their maximum power. The output power of the four klystrons is still below its maximum value, indicating that there is some margin for further energy increase. 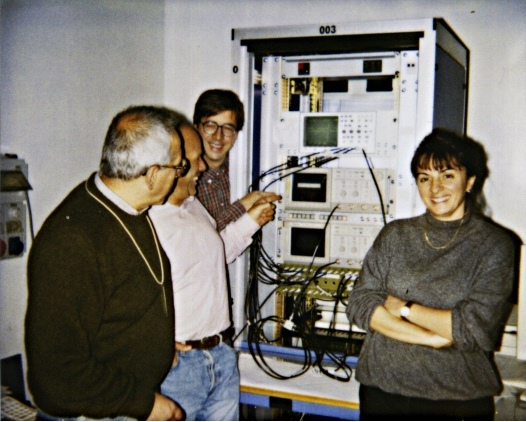 On December 19, 1996 the DAFNE LINAC accelerated 26 mA positron bunches at 400 MeV. This result must be compared to the Linac acceptance test value of 11 mA and to the final design figure of 36 mA. The electron current impinging on the conversion target was 3.6 A (4.0A design), at an energy of 150 MeV (250 MeV design). The final energy of the beam was limited by one of the four klystrons running below its maximum power, because of conditioning problems. Full energy at the converter will be reached after retuning one of the SLED systems in the high current part of the LINAC. These figures show that there are large improvement margins to reach the full performance with positrons in a short time. Design performance of electron storage into the DAFNE Accumulator, was reached on November 30, 1996. 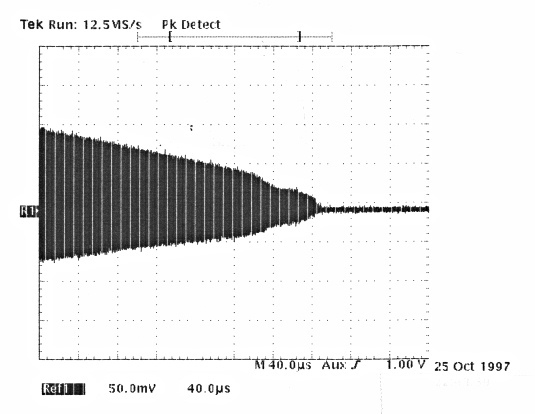 The full charge of a DAFNE Main Ring bunch (9x10^10 particles) was injected into the booster at a Linac repetition rate of 5 Hz. The injection rate was compatible with an injection time below 1 second at the full repetition rate of 50 Hz. On July 12, after only two days of commissioning, the first positron pulses have been observed downstream the positron converter into the DAFNE LINAC. The positron beam, cleaned from the electrons by means of a "chicane" of dipoles, has been accelerated through the high energy part of the LINAC and observed on a fluorescent target at the beginning of the Transfer Line towards the Accumulator. 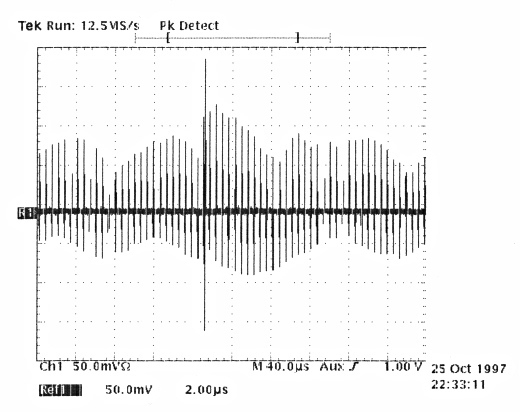 The average current within the 10 ns LINAC pulse was in the order of 2 mA. FIRST ELECTRON BEAM STORED INTO THE DAFNE ACCUMULATOR on JUNE 21, 1996 !!!!! In the evening of June 21, with the RF cavity switched on, a first electron beam of few milliamperes has been stored into the DAFNE Accumulator, The stored beam has been observed both on the striplines in the ring and on the synchrotron light monitor. The beam lifetime was larger than one hour. A first electron beam has been injected into the DAFNE Accumulator, on Friday, 7 June a few hours after midnight. The electron beam, accelerated at 0.5 GeV in the Linac, has been transported all through the Transfer Line in the electron branch up to the fluorescent screen at the entrance of the storage ring. After tuning only one out of the eight orbit correctors in the ring, some hundreds revolutions in the ring were observed (without the R.F. field in the cavity) on the strip-line position monitors of the Accumulator. MAIN RING CAVITY TESTED SUCCESSFULLY IN FINAL CONFIGURATION on APRIL 3rd, 1996 !! The first RF cavity for the DAFNE Main Rings, fully equipped with 3 HOM waveguide absorbers, has been power tested in a dedicated RF Hall. In one day of RF conditioning the input power was raised up to 22 kW/cw for a gap voltage of 300 kV-peak, which is more than required for the DAFNE operation. The measured quality factor of the cavity is 33000. No multipactoring or discharges occurred during the tests.